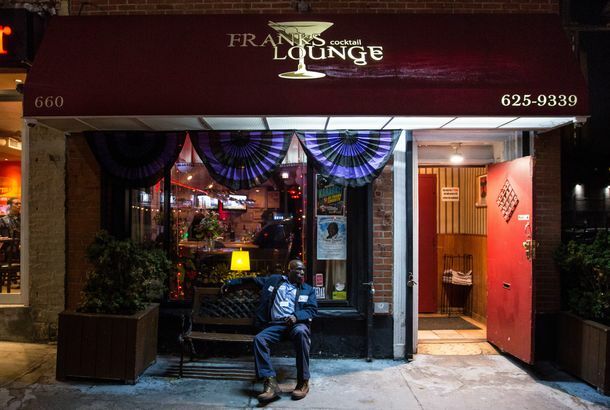 Frank’s Cocktail Lounge Is the Perfect Bar — Frank Perkins Is the Reason WhyIn Fort Greene, a squat building houses an iconic bar that has resisted gentrification for more than four decades. 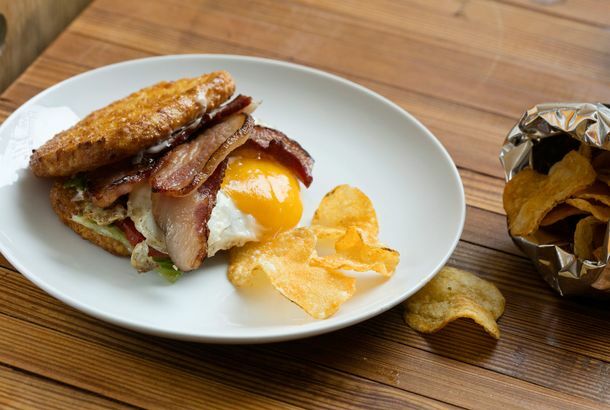 Meet the ‘Double Brown,’ a BLT Served Between Two Hash Brown PattiesThe new all-day Brooklyn restaurant, Hudson Jane, has trademarked the sandwich. This New Brooklyn Restaurant Specializes in Open-Fire CookingThe Argentine chef at Mettā, opening Thursday, used to work for Francis Mallmann. This Airy Townhouse Is Actually Only 11 Feet WideA new architecture firm’s first project: an extremely narrow Fort Greene home. Meet the Francis Mallmann Disciple Who Will Only Cook With Fire in New YorkNorberto Piattoni has ambitious plans for his Fort Greene project. Colonia Verde’s Next Sunday Asado Features Alex Raij and Fany GersonGrub Street’s Sierra Tishgart hosts the afternoon hangout on June 12. A Shuko Alum Is Behind a Hidden New Japanese Restaurant in Fort GreeneAnd a bartender who hails from ZZ’s Clam Bar. For Once, a Beloved But Troubled Neighborhood Joint Won’t Actually CloseFort Greene’s Madiba was on the verge of closing but will stay open thanks to $20,000 in crowdfunding and a renegotiated lease. Colonia Verde Is Back, With New Dishes and a Charming Outdoor SpaceThe Fort Greene restaurant caught fire back in February. Watch a Touching Video About Colonia Verde’s Post-Fire RecoveryThe Fort Greene restaurant reopens on June 23. Gentrified Brooklyn Terrorized by Purse-Stealing Old LadyThe unassuming 68-year-old struck in Park Slope and Fort Greene. Janitor Charged With Sexually Assaulting Teenager at Brooklyn School His daughter said he had worked at the school for almost 20 years. Vandals Graffiti Next to Spike Lee’s Old HouseAnd an anarchy symbol, of course. What to Eat at Colonia Verde, the Cómodo Team’s Fort Greene RestaurantFelipe Donnelly will make good use of the wood-fired grill. Habana Outpost Opening Takeout Sandwich ShopHabana To-Go will be open year-round. Brooklyn Resident Tells Film Crew It’s Not Welcome in These Here PartsSpotted: an angry sign. Former Employees Set Up Shop in Former Cake Man Raven SpaceThere’s already a line down Fulton Street. Why Developers Didn’t Destroy BrooklynTwo recent movies get it wrong. Matthew Kaner Working to Open Bar Covell in New YorkHollywood’s quirky, list-free wine bar is headed east. Tilapia Grows in BrooklynVertiCulture’s rooftop farming mission: peace, love, vegetables, and tilapia. What to Eat at Prospect, Bringing Urban-Farm Fare to Fort GreeneSee some dishes in our slideshow. Brooklyn Park Closes Earlier Closer to Housing ProjectsOne half of Fort Greene Park closes at 9 p.m., while the other closes at 1 a.m. Hmmm! 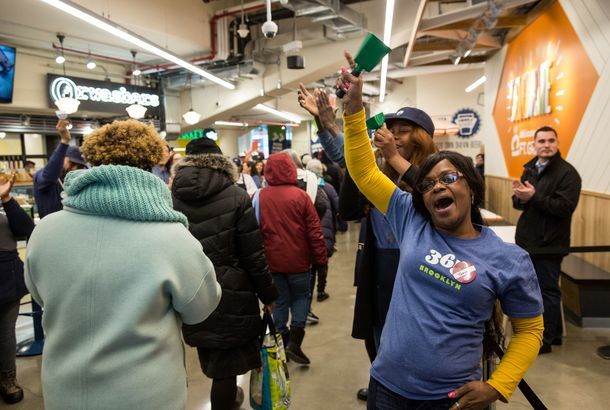 Brooklyn Baker Must Sell 1,600 Pies Before Thanksgiving — or ElseIf Adrienne Braxton doesn’t hit her quota, she’ll have to close her bakery for good. Tillie’s Is on the BlockIf you’ve got $189K, you could own the coffee shop. South Slope 49-Year-Old Is Very Good at Holding a Full Mug of Beer Outstretched in Front of His BodyHe’s headed to the national championships of … that. Japanese Pop-up From an Annisa Chef; City Chicken Wants Your Help With CoopsPlus: a beer dinner at Landmarc, a lip-smackin’ Fourth of July barbecue menu in Times Square, and more, in our daily roundup of neighborhood food news. DB Bistro Moderne Turns Ten With a Special Menu; Bacon Bakery in the WorksPlus: Fourth of July preordering from Prime Meats, and more, in our daily roundup of neighborhood food news. Laurent Gras Co-hosts Dinner at Aldea; Zac Young’s Drunken Donuts PartyPlus: Bar bites at a video shop, a restaurant that sells soup dumplings and bratwurst, and more, in our daily roundup of neighborhood news. Moe’s Actually Definitely ClosedThe Fort Greene bar is down for the count. Edi & the Wolf Announces Brunch Menu; Betel Comes to Brooklyn FleaPlus: a new happy hour, Fatty Johnson’s closes, and more, in our daily roundup of neighborhood news. Walter Foods Expands to Fort GreeneAnother Williamsburg to Fort Greene expansion. Next Summer, Brooklyn Flea to Split Time Between Fort Greene School Yard and EDGE Williamsburg GroundsThe Flea finds a new home! Well Now Moe’s Says It’s Closing, TooThe Fort Greene bar is the latest Brooklyn joint to announce its closing. Roman’s and Lot 2 Get Three Stars; the Burger Trend Don’t StopPlus, the season’s best apples and most creative pastrami dishes, in this week’s magazine. Cake Man Raven Is Shuttered by the Health Department Once AgainPlus: Market Table and BLT Steak rack up even more demerits. Clinton Hill’s French Invasion: Mango Crêpes and BaguetteAboutit OpenSeriously, it’s a “Paris-meets-Brooklyn” concept café. Try Some Pork-Bun Ice Cream With Fort Greene’s Ice Cream ClubThere’s also Buffalo blue cheese, if you’re feeling ambitious. First Look at Mauzac, a Park Side Wine Bar in Fort GreeneA Penang veteran opens a bar that takes its inspiration from Mauzac grapes. First Look at Dino, Serving Northern Italian Food in Fort GreeneA veteran of Frank in the East Village opens his own Italian restaurant in Brooklyn. Russian Spies Met at Fort Greene Coffee Shop, Grumbled About Work StuffThey were just like us! A New Taco Truck Comes to Midtown; Juice Press to Offer Cooking ClassesPlus: An Ecuadorian food truck in midtown, and a La Belle Torte pop-up shop in Greenpoint, in our roundup of daily neighborhood news.